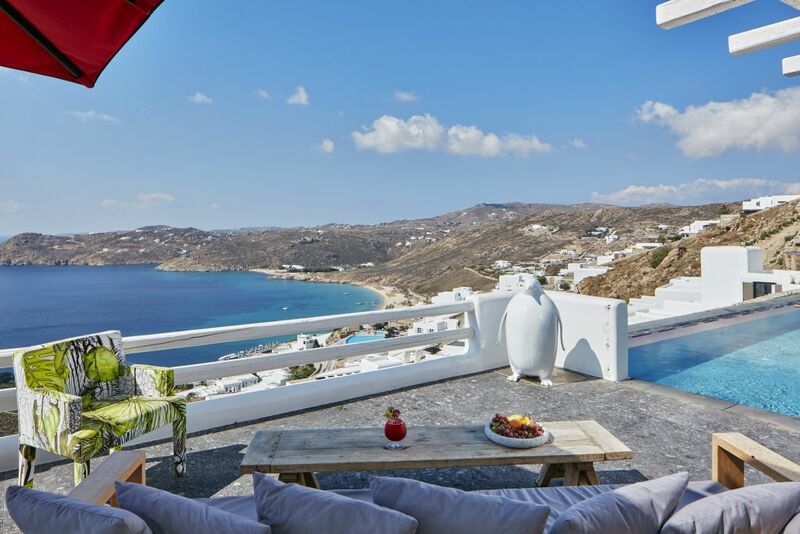 With its striking white buildings, blue skies and lingering sunsets, it’s no wonder that Mykonos was the destination chosen as the backdrop to the 1989 smash hit Shirley Valentine – or indeed that the island has sustained its lavish status, despite the recession in Greece, thanks to its reputation as a holiday hotspot. Yael Morad, one of many Israelis staying at the five-star Myconian Avaton Resort, enthuses about this beautiful Greek island. “There is nothing like this in Israel, it’s an easy journey and it makes a really lovely break,” she says. To understand more about the island’s magic, I decided to take a stroll around the capital, Chora, one fine evening and walked past a series of bright white windmills overlooking the sea. 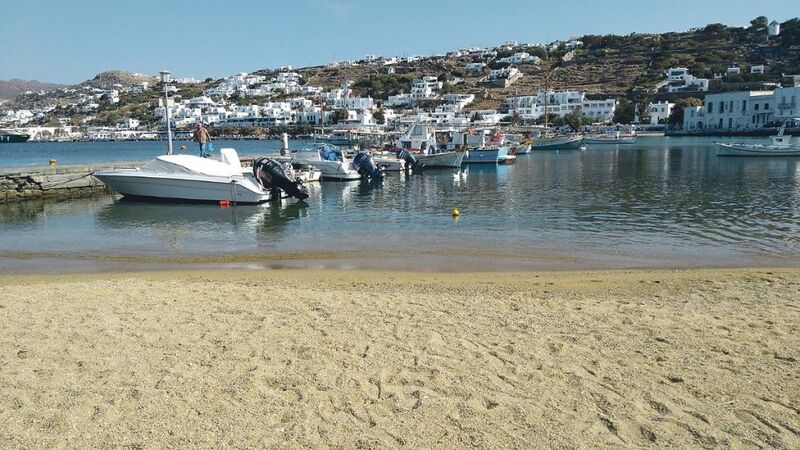 These are the famous landmarks, not only of Mykonos itself, but also the whole of the group of islands to which Mykonos belongs: the Cyclades. The mills were an important part of the economy as they used to grind cereals and provide bread to passing ships. Continuing on, threading around many churches and smelling the sweet fragrance of the bougainvillea trees, I came upon an unexpected library and cultural centre open each evening until 11pm. It was donated by a local teacher and intellectual, who gave up his substantial house to host an extensive collection of music and books. When I reached the centre of Chora, I was immediately swept along by the locals dancing in the narrow streets – a feat probably only possible during the low season – to join the general air of happiness. It’s not always been quite this cushy. 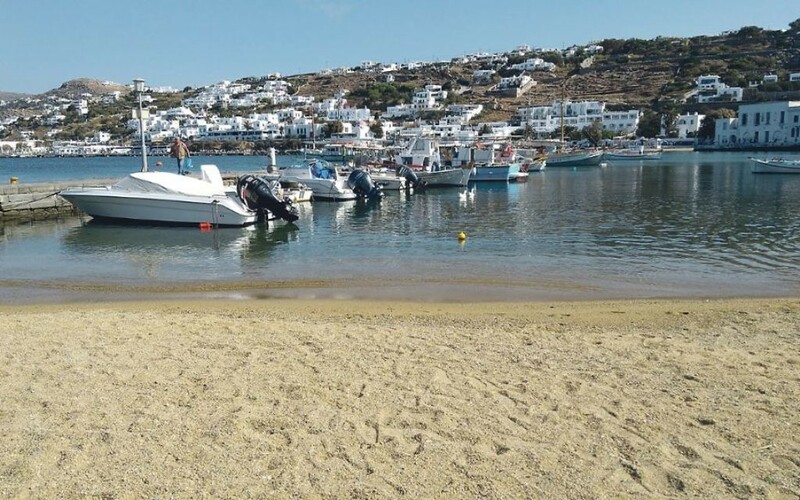 During the 1950s, Mykonos ran a barter economy and was bare and poor. But all was transformed when Greek shipping magnate Aristotle Onassis and his uber-stylish wife, Jackie O, famously dropped anchor. Thereafter, the island became known as a mecca for the rich and famous. One man in particular saw this trend and helped the island monetise its potential. George Daktylides, who operated the public transport system, went on to build the first hotel in 1979 and, within a few years, had opened the five-star Ambassador Relais & Châteaux. He and his wife Eleftheria simultaneously made the decision to send their four sons to the finest International Hotel School in Lausanne, Switzerland. 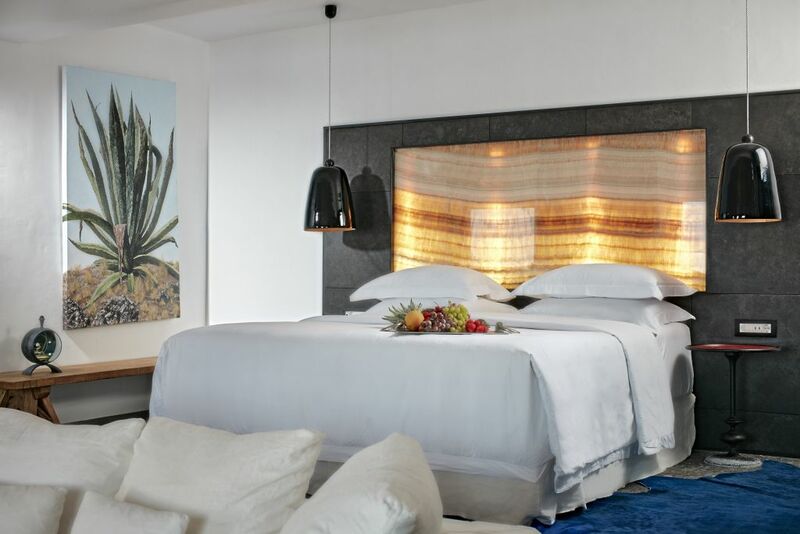 The result today is the Myconian Collection, run by the boys and comprising nine outstanding hotels, which together have changed the status of the whole island. 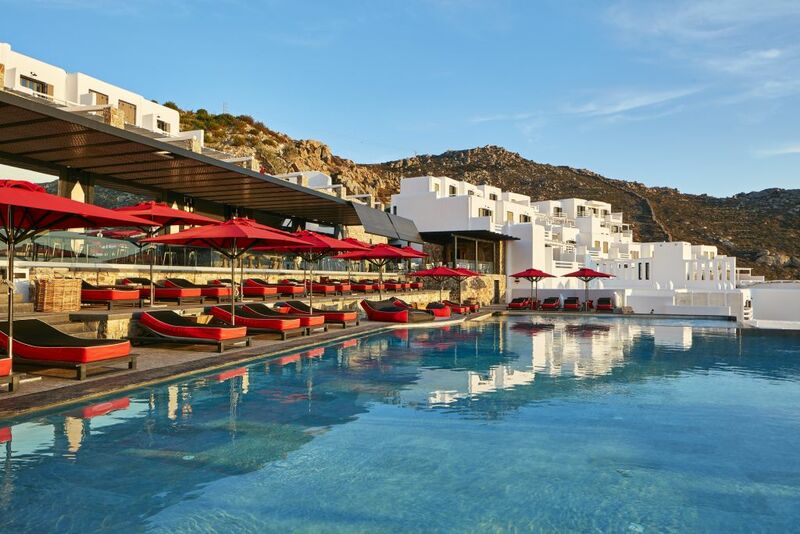 Each one has its own design features, spas and special characteristics, making Mykonos one of the ritziest tourist spots in the world. On day three of my stay, I tore myself away from the luxury and took the short two kilometres ferry ride to the island of Delos – one of the most important historical and archaeological locations in Greece and, understandably, a UNESCO World Heritage Site. Only a select few archaeologists live there, and I was told in advance about the importance of wearing good walking shoes and taking a bottle of water, as there is very little shade. As visitors are only allowed a maximum of four hours, remember to research in advance the times of return ferries. Then we were advised to turn off our phones and let the ferry transport us back in time. 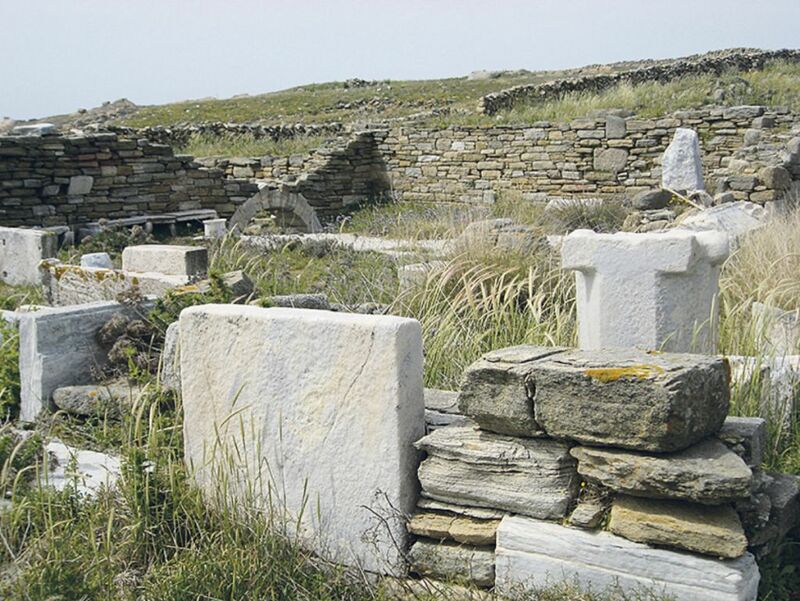 The origins of Delos trace back to Greek mythology and, according to the tale, both Apollo and his twin sister, the goddess Artemis, were born here, rendering the precious island sacred. As a consequence, all pregnant mothers were sent by boat to give birth on a neighbouring island, but despite this inconvenience, by 100BC the community had grown to 30,000 people. The Romans converted Delos into a free port attracting a multitude of traders and it became a hub of commercial, military, maritime trading and slaving. Our guide took us to see the huge amphitheatre where the community went to enjoy themselves, and then to some beautiful houses, complete with mosaic floors, where the prosperous merchants lived. Finally, we viewed the famous Terrace of the Lions, the ancient statues that guarded the garden where Apollo and Artemis were said to have been born. On the eastern side of the city, far away from the most important ruins, is what is thought to be oldest synagogue known in the world today. A team led by archaeologist André Plassart discovered the ruins in 1912 – the synagogue is believed to have remained in use until the end of the 2nd century AD. It consists of two large rooms containing a throne and multiple marble benches. While there is disagreement between academics as to whether it is an actual synagogue or not, there is a certainty that Jews did at one time live and prosper here on this fascinating island.